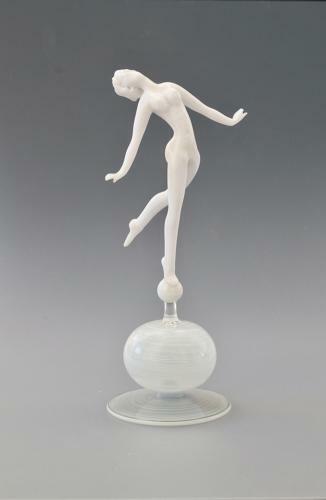 Glass female figure 'dancer' standing on on a glass ball by Istvan Komaromy C1950's. Note: Istvan Komaromy was famous for his dancers, Komaromy also sculpted other classical figures such as stags, does and horses. All his work was made using a busen burner, and either solid or tubular coloured or opaque glass rods. Condition: Very good with no chips, cracks or evidence of restoration. There is a piece of blu tack under the base used to either secure the figure or weight the base.